Hamsters, like other pet rodents, require a varied diet to meet their full spectrum of nutritional needs. In addition to commercially produced pellet food, hamsters need small amounts of vegetables daily. Be mindful of the amounts, limiting the daily serving to about a tablespoon. Overfeeding vegetables can result in a variety of health problems. 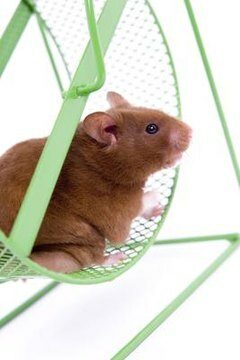 The most natural consequence of feeding your hamster too many vegetables is that he will develop diarrhea. This will stem from gastrointestinal disturbance and can result in painful or uncomfortable cramping for your hamster. It also creates a messy cage that you'll need to clean to ensure you’re maintaining a healthy environment for your pet. An accompanying result of vegetable-induced diarrhea is dehydration. If your hamster has an excessive amount of diarrhea and is lethargic and listless, make sure he has constant access to a fresh, clean water supply. Unwashed veggies that contain a chemical residue can also create digestive problems for your hamster, so make sure the food you offer is adequately washed in addition to limited in quantity. Your hamster may prefer the taste of crunchy fresh vegetables over his regular dry commercial hamster pellets. But if he fills up on nothing but vegetables, he may ignore his other food, which can result in him developing an unbalanced diet lacking in necessary nutrients. If your hammie seems to be ignoring his pellet food, cut back on veggies to encourage consumption of other foods. Stick to vegetables like broccoli, carrots, cucumber, cauliflower and greens. Avoid acidic vegetables such as tomatoes, as well as all fruits. The high sugar content of fruits can be hard on a hamster’s digestive system. If you have concerns about the type of amount of food you’re feeding your hamster, consult your vet for advice. Remove uneaten vegetable matter from your hamster's cage after a day so it doesn't spoil and rot, which could cause stomach upset as well as attract bugs and make your cage environment smell bad. Get into the habit of feeding your hamster fresh vegetables in a container that you can easily insert into and remove from the cage. This will help with portion control, allowing you to observe how much your hamster is eating, and it will help prevent spoilage. If your hammie hoards food, check his favorite spots to make sure he isn’t hiding rotten veggies.